My 7-year-old girl just had her ear piercing in January. After some research online, I decided to buy her first pair of earrings from tiny Blessings. They came in with beautiful delicate packaging. The pearls look round and flawless. The screw-back is not that easy to put on but it's not an issue. My daughter loves her new earrings and can't wait for her second pair from tiny Blessings. My daughter received these as a first birthday gift and now they are my go to gift for all the baby girls in my life. They're classic, the screw on backs don't fall off, and they're well sized. They're the perfect size for a very little one. Had these for four months and they have been great. Everyone comments on how cute they are. We are ready to buy another pair. I bought these for my daughter. I like how simple and pretty it looks.The screws are pretty sturdy, that being said my daughter lost hers. I only wish that the screws were not so expensive and had free shipping,. We bought these for our granddaughter. She is 9 months old and they will be used to get her ears pierced. We had bought for her baptism and beautiful bracelet and these earrings are just as beautiful. I will plan on continuing to buy products from tiny blessing for the future. I purchased this earrings as a gift and I am fascinated. They are delicate and absolutely gorgeous. I am so happy with the quality of the pearls. The wrapping is cute and elegant. This are exquisite earrings, I love them. They are perfect earrings for my 5 month old. They fit nicely and I was happily surprised at the quality and presentation. They also arrived earlier than expected. The screw back was exactly what I was looking for and easy to put on a squirmy baby. She has received so many compliments. This would be a great gift idea for my nieces. I wanted a pair of stud earrings for my granddaughters 1st birthday. These pearl earrings are perfectly round no blemishes definitely AAA quality. They appear to be well made and the stud length and screw backs keep them secure. Perfect for my 2.5 year old! Good quality. Pretty earrings. Backs are very hard to attach. They are the perfect size for my 2year old niece. The tiny backs are perfect - no sticking the baby. I highly recommend these beautiful earrings. Absolutely stunning. So pretty and prestine. Perfect size for a new born and will still look beautiful many years to come. The packaging is amazing, and it comes with a authenticity certificate. Best earrings I could've gotten for my 3 month old daughter ! I will be buying more jewelry from this page ! Made very well, will last a long time. Look great on my 1 year old. Super satisfy!! Great products, super fast delivery. Very nice earrings!! The service was amazing, shipping fast, and the quality of the earrings 100%. Absolutely Love! perfect for my 6 month old daughter! The earrings arrived very fast and the packaging is very beautiful,my brand new granddaughter will look pretty in them. I just love it and will be adding a collection for sure. Perfect for a little girl. Comes with a certificate of guarantee noting the grade and quality of the pearls. They are exquisite. Just what I wanted for my granddaughter's baptism. They are beautiful! Fit my 7 months old baby girl perfect. They are so cute and they came in a very cute little box also. The bracelet and earrings were spot on. So adorable. Customer Service was very helpful. Beautiful earrings for my baby granddaughter, just the right size. Ordering from Tiny Blessings was easy. I live in the UK and we cannot get these type of stud earrings with screw backs. They shipped my order extremely quickly and the package arrived 4 days later, excellent service. Tracking was easy and I was informed when they would be delivered. Quality of the earrings exceptional and would not hesitate ordering from Tiny Blessings again. I would definitely recommend Tiny Blessings to anyone wanting to buy quality jewelry for children. The earrings I purchased for my granddaughter were absolutely perfect in every way and the packaging was unbelievably nice. I'm already considering my next purchase. I was so thrilled when I received these beautiful pearl earrings for my baby girl! She has very sensitive skin so I was searching for high end quality jewelry that would last and not irritate her skin! These were absolutely perfect in every way from the packaging to the earrings themselves. Highly recommend this company overall to anyone! I will continue to shop here over and over again! Purchased them for my 11 month old daughter and they are a perfect proportion to her ears! Beautiful and timeless! I bought these for my 3-year-old after she lost 3 different earrings. I looked high and low for ones with a screw back. These were not inexpensive but I splurged hoping that these would last for a while. They are adorable and seem like great quality and my daughter thinks she looks like Cinderella. My granddaughter recently got her ears pierced so Nana had to buy her quality earrings. The earrings were everything we hoped they would be and more. She loves them...now if we can just get her twin sister to have her ears pierced. I ordered these beautiful earrings for my best friend's daughter christening!! She loved them. They looked so beautiful and sweet on her. She is 7 months old. Size was perfect. This is the second time I've purchased from Tiny Blessings. I've been consistently impressed with the company in many areas: their level of phone support and customer service; gift packaging, speed of shipment and, most importantly, the quality and design of the earrings themselves. I had scoured the internet for something that was appropriate for younger girls in either sterling or 14k gold, and so delighted to finally find this company! Some may think the 4mm pearls are too small for a five year old or older, but they're very delicate and pretty. One cautionary note: my granddaughter at age 7 found the screw back design pinched her ear. The 5 year old has had no problem. We do love the screw backs since they don't lose them. My first grand daughter was born this year and at 2 months old we pierced her ears. Of course, I wanted the best earrings for her that I could buy and after searching and searching I found " Tiny Blessings". There was a great variety of earrings and other jewelry that I loved. I ordered the 4mm Pearl Studs and I was very impressed in the speed of receiving the order, the quality of the product and the presentation. The other reason I bought them was because of the screw in cap that fits on the post. That way the post won't bother her and she can't pull them off. I recommended the sight to my friend who in turn placed an order for a bracelet for her grand daughter who is making her first communion. Thank you Tiny Blessings and I will continue to order from your site and continue recommending your site to my family and friends. What a beautiful pair of earrings. They are great quality and I love that they are screw backs. That ensures that they stay in my 9 month old's ears without poking her. These pearls are so creamy and shiny. Great quality and super fast shipping. Bought both a 3mm and 4mm for my 6month old. They were smaller than I imagined but the 4mm looks ok.
delicate tiny pearl earring perfect for a newborn! got beautiful pearl earrings for a great price, but the greatest surprise of all was the great presentation the wrap was beautiful. Amazing site, I love it! I have bough two sets of pearls for baby girl, one for my daughter the other for my niece! I hope to get her a designer bracelet next! I bought these for my 3 months old baby and they are just perfect! My husband loves them too! She looks so cute with them, and I love the packaging, the presentation itself was just very cute! Also love that the pearls are genuine and it comes with the certificate. Would definitely buy from them again! I am in love with this website!! Definitely recommend this size, I read a review and made me take these instead of a smaller ones and I am glad I did! The quality, everything is just perfect, thank you tiny blessings!!! My granddaughter was so exited that she has had them on ever since I gave them to her. Good quality and workmanship. Look great on her and sized perfectly. Really nice pearl earrings purchased for my 6 month old niece who is now 11 months, love them!!!! Only problem is they are long on her thin ears but other than that they are packaged and mailed very professional. no problem with them they look great!! Best ever earrings I got my daughter. Great quality. Great service. These earrings were the perfect gift for my two year old grand daughter! They match the bracelet that we gave her on her first birthday from Tiny Blessings. The quality of the jewelry is excellent and the packaging beautiful. 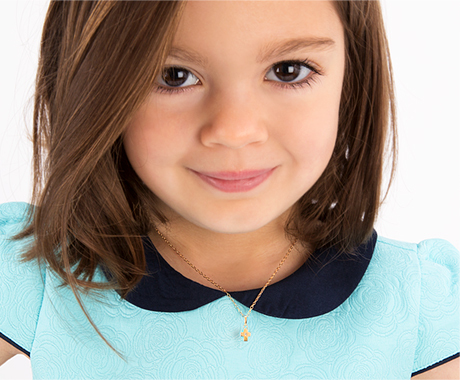 We plan on making a tradition of ordering jewelry from Tiny Blessings for every one of our grand daughters birthday! Absolutely perfect for my Grand daughter! These pearl earrings are the perfect size for my 5 month old granddaughters tiny earlobes. The shorter posts and screw back are perfect for a baby!!! Beautifully packaged too! This is my second purchase of earrings for a baby...the pearls are beautifully boxed with a ribbon around it..a little pouch is included to keep the pearls in once opened...the ordering and receiving went very smoothly...I would just caution to see just what 3mm and 4mm look like...these I bought for a 3 month old, so ordered the 3mm...which were VERY tiny...so exchanged for the 4mm..which is only slightly larger, but were a better size...the exchanging went just as smooth...very happy with the purchases at Tiny Blessings. These are absolutely adorable mini pearls! Perfect size for my 6 month old. Great quality, fast shipping, stays on, cute packaging, can't ask for more! I am 9 years old and I ordered the 4 mm pearls. I think this is a great size for girls my age. These earrings are very pretty. After I ordered these earrings they came here really quickly. I highly recommend these earrings. elegant and quality customer service!!! Bought these 4mm 14k gold pearl earrings for a Christening gift. The mom just loved them and sent me a picture. They were wrapped beautifully with a card that was written lovely. Amazing how quickly they arrived: ordered on a Wednesday from Florida and arrived in California by Friday. I ordered late and didn't expect them to arrive on time for the Christening but they did. I would definitely order again and recommend this site to my friends. Quality Customer Service!!!!! I absolutely adore these pearl studs especially the fact that they are screw back. I got the 3mm size and they are so cute. Awesome item, I will buy here from now on. Perfect. No other words to describe this on our granddaughter. I absolutely love these earrings for my baby. They are screw back and the posts are long enough to move around the earring. We had problems in the past with posts that were too short and the skin around the earring getting irritated. I can easily clean around the earring without taking them out. Simply perfect for my little one and my niece. Absolutely love them! They look perfect on my toddler! So very cute, great pair of earrings for baby that will last a lifetime. You will not be disappointed with these earrings.